This is a list of basic computer system requirements to use Canvas. It is always recommended to use the most up-to-date versions and better connections. Canvas will still run with the minimum specifications, but you may experience slower loading times. Learn more about browser requirements. Canvas is best viewed at a minimum of 800×600, which is the average size of a notebook computer. If you want to view Canvas on a device with a smaller screen, we recommend using the Canvas mobile app. Because it’s built using web standards, Canvas runs on Windows, Mac, Linux, iOS, Android, or any other device with a modern web browser. Learn more about basic computer specifications. Flash is required for recording or viewing audio/videos well as uploading files to a course or an assignment. Other than these features, Flash is not required to use most areas of Canvas. Please note that some browsers may no longer support Flash. We recommend following any browser security policies established by your institution, especially if you are using Canvas on a computer provided by your institution. You may want to use Canvas in an alternative browser instead. If you are using a browser that is affected, please be aware of possible restrictions. The following are known issues in specific browsers that may block or create mixed content within Canvas. Google Chrome verifies that the website content you view is transmitted securely. 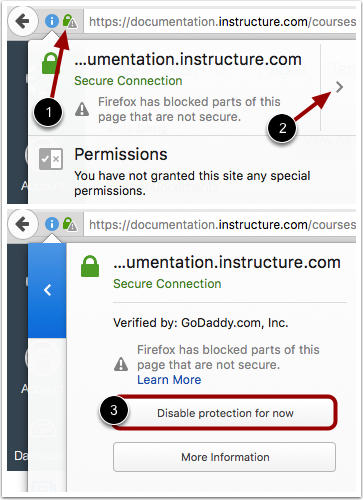 If you visit a page in your Canvas course that is linked to insecure content, Chrome will display a shield icon  in the browser address bar. You can choose to override the security restriction and display the content anyway by clicking the shield icon and then clicking the Load unsafe script button . The Canvas interface was optimized for desktop displays, so using small form factors such as phones may not be a pleasant experience in using Canvas. Canvas is not officially supported on mobile browsers. We recommend using Canvas mobile applications for an improved user experience. At this time, Canvas apps are only available in English.